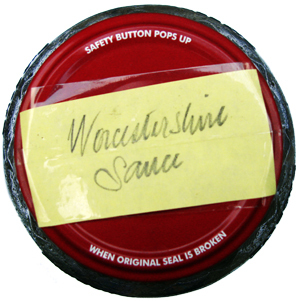 Homemade Worcestershire Sauce – the 2014 edit | What's for tea tonight dear? This entry was posted in Christmas, Gift, Pescatarian, Recipe and tagged anchovy, black pepper, black treacle, Bloody Mary, cardamom, cheese on toast, chilli, Christmas, Christmas food, cinnamon, cloves, colatura di alici, condiment, garlic, Gary Rhodes, ginger, homemade, homemade Worcestershire Sauce, Lea and Perrins, mace, malt vinegar, nutmeg, porcini, recipe, shallot, soy sauce, tamarind, treacle, vinegar, Worcester Sauce, Worcestershire Sauce. Bookmark the permalink.